Sell to Us Price: $73.34 each. Please call 1-800-800-1865 for our best pricing! People have been investing in gold for centuries. Gold’s appeal is that it preserves wealth and purchasing power over long periods of time. Wealthy families have passed gold from generation to generation, using the metal as a private and portable store of value. Gold coins are one of the most popular ways to invest. Here we will talk more about coin options, specifically the 1/20 oz. gold coins. Whether you’re an investor or just a collector, these coins can be a valuable addition to your portfolio. Below we will cover which coins are the most common and most popular and where can you find them. Gold coins have been minted by the governments of different countries since time immemorial. Bullion coins, intended for investment rather than for circulation as money are more recent phenomena. Nations us them to showcase and preserve cultural heritage and to offer investors a trusted option for physical gold. The most common sizes are 1, 1/2, 1/4, 1/10 and 1/20 troy oz. The reason 1/20 oz. gold coins are popular among investors is because they are an affordable way to buy popular gold coins, and may serve well for use in barter and trade. Their size puts them within reach of small investors. Coin collectors are also interested in the size in order to complete a “set” - a coin of each size minted for a particular series of coins, such as the Canadian Maple Leaf. There are a number of options for 1/20 oz. gold coins available on the market. Their value can vary based on the mintage year, quality, and rarity. Below are some of the most popular of these coins. The Maple Leaf from Canada is another widely traded bullion coin series. Since the Royal Canadian Mint issued the first one in 1979, these coins have been grabbing the attention of investors and coin collectors worldwide. Unlike the Kangaroo, the 1/20 oz Canadian Gold Maple Leafs comes in just one design. The reverse features the iconic Canadian maple leaf, along with inscriptions that read ‘Canada,’ ‘1/20 oz Or Pur,’ and ‘9999,’ signifying the 99.99% purity of these coins. The obverse shows the profile of Queen Elizabeth II, along with the coin’s face value and the production year. 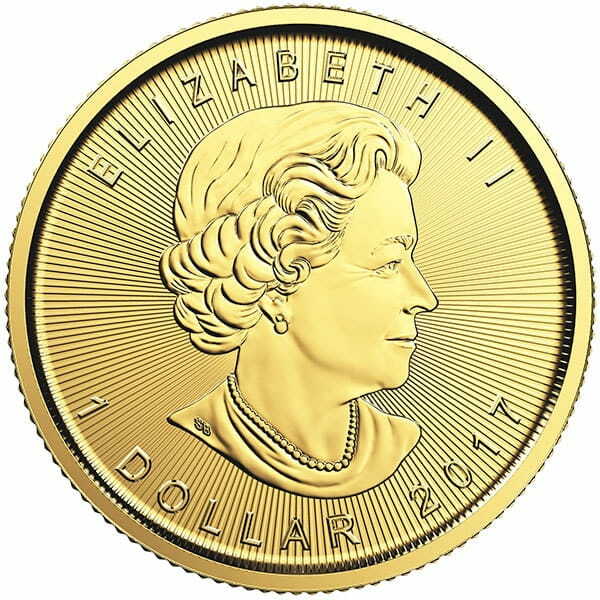 The Canadian government guarantees the quality and purity of these coins, and the good thing about them (and other .999+ pure gold coins) is that they can be added to your IRA, in addition to your general investment portfolio. Money Metals Exchange offers the 1/20 oz Gold Maple Leaf coins from the Royal Canadian Mint. 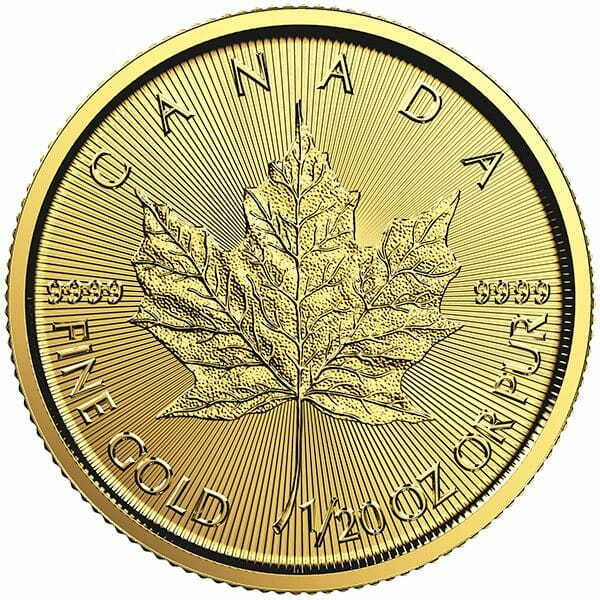 Guaranteed by the Government of Canada, gold Maple Leaf coins have become some of the most recognizable and desirable bullion coins in the world today. So if you're looking to buy gold online, the 1/20 oz among the smallest and most affordable sizes available. This one twentieth-ounce gold bullion coin is beautifully struck with a gold purity of .9999 (24 karat). The Queen (obverse) - The classic design features the right facing bust of Queen Elizabeth II wearing a necklace of pearls. Maple Leaf (reverse) - The reverse depicts a single Canadian Maple Leaf, the national symbol of Canada. The finely detailed design has a proof-like strike. 1/20 oz Canadian Maple Leaf Gold coins are available through Money Metals Exchange while supplies last. 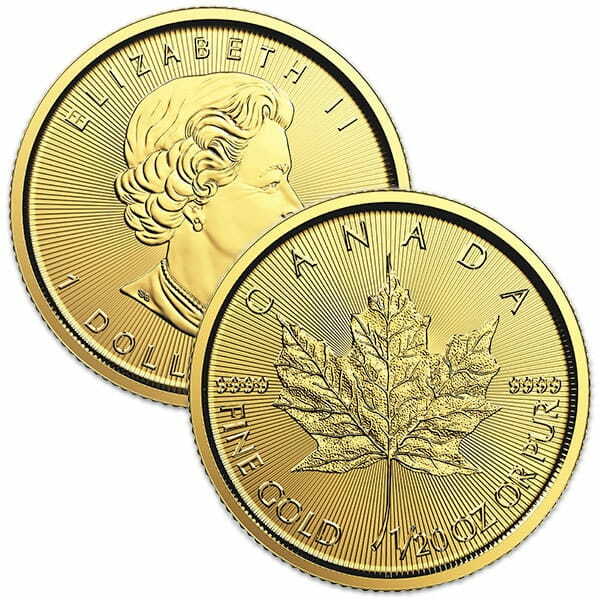 We also offer the Canadian Gold Maple Leaf coin in four additional sizes. (1/10, 1/4 oz, 1/2 oz and the widely popular 1 oz) Please call us at 1-800-800-1865 for more details. If you're interested in silver coins, the Maple Canadian Mint coin also comes in different sized silver coins. Or if you want to add a variety of silver coins to your stack, we have silver coins from different worlds mints as well, with US silver coins for sale being the most popular. Australia’s Perth Mint produces some of the most thoughtfully designed and well made gold coins on the market. They have produced coins in many different series, so collectors from all over the world adore them. The Gold Lunar Series is one the most sought-after among Australian coins. Inspired by the Chinese zodiac, these coins celebrate each year with the design of its corresponding animal. The Perth Mint started producing them in 1996 and ran till 2007. Due to the high demand, the production of Series II launched the following year. 2018, for example, is the year of the Dog. Coins in the series depict a Labrador retriever on the reverse side. Another popular Australian coin series features the Kangaroo. Since 1987, this well-known symbol of Australian wildlife has been depicted on the backside of these coins, with the design being changed annually. The obverse, like all Australian coins, features a portrait of Queen Elizabeth II. Introduced in 1982, Chinese gold coins proudly display the country’s rich cultural heritage. The 1/20 oz. version was issued later, but today it’s one of the more common of these coins. The design changes each year, but retains a general theme. The reverse always shows China’s most beloved animal – the panda bear. The panda has long been associated with China, so it is little surprise the image found its way on to the nation’s gold coins. The coin’s obverse design has been the same since the beginning. It features one of the highlights of Chinese architecture, the Hall of Prayer for Good Harvest, which is a part of the Temple of Heaven complex in Beijing. This sacred place is a very important part of Chinese tradition, so the coin will likely continue to carry that design for the foreseeable future. Each size Gold Panda coin (like most sovereign coins) has a face value stamped on them. The 1/20 oz size, the smallest of the series, has a face value of 20 Chinese Yuan. Today this coin is no longer produced. The Chinese Mint discontinued making coins in troy weight and now produces gram denominations only. South Africa decided to celebrate the 50th anniversary of Gold Krugerrands, by issuing 1/20 oz. coins for the first time in 2017. They were struck at the South African Mint in 22-karat gold, but only 2,000 of them were made, so they are relatively scarce. The obverse depicts the image of South Africa’s first president, Paul Kruger, along with the inscriptions that read ‘South Africa’ in English and Afrikaans. The reverse features South Africa’s national animal, the Springbok antelope. The coin’s gold weight and year of minting are also displayed here. There are a few ways to acquire 1/20 oz. gold coins. They can be purchased in a private sale directly from someone looking to sell. The two most popular sources are from national dealers and local coin shops. National dealers do the most volume and tend to have the best availability and lowest cost. Just make sure to choose a well-established and reputable firm. Buyers make payment upfront, so it is important to be confident the coins will be delivered as promised. Buyers who prefer a more personal approach, may be able to find a local dealer in your area. The selection of 1/20th ounce coins is likely to be limited and they may cost a bit more. But there is an opportunity to inspect the coin prior to purchase. Thanks to their size and availability, 1/20th oz coins are a great way to start an investment in gold bullion. Investors with a limited budget can easily afford them. And all investors can benefit from diversifying their gold holding with coins in a small denomination. Whether you’re an investor looking to build a nest egg, or a collector searching for the next piece in your set 1/20th oz gold coins should fit the bill. Our current buy pricing is $73.34 each and we will buy up to 40 ounces at this price. Simply call us on any weekday to lock pricing at 1-800-800-1865. You can now sell your 1/20th oz Gold Canadian Maple Leaf, .9999 Pure back to us online, at a price of $73.34 each!